What can you do at Barangaroo Sydney? Barangaroo Sydney should be on your list of places to visit in the NSW capital. We sent Janeece Keller to explore the area with a 10-year-old in tow. Barangaroo sits on the headland at the north-western end of the Sydney CBD – close to The Rocks and an easy, flat walk to Darling Harbour. You can access Barangaroo by ferry from Circular Quay or by a well sign-posted, six-minute walk from Wynyard train station. 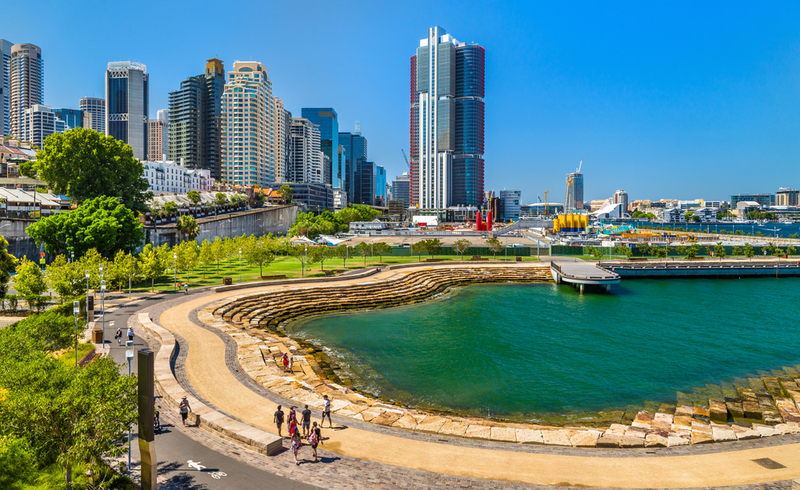 Barangaroo Reserve, at the northern end of the headland, has an Australian native garden, spectacular Sydney Harbour views, extensive walking and cycling trails and plenty of picnic spots. The southern end has shops and restaurants; food-court fare to fine-dining restaurants. Families of all tastes and budgets will find themselves spoilt for choice when it comes time to eat at Barangaroo. It’s funny how sometimes you just don’t make the time to visit places closest to home, so we decided to have a Sydney staycation to explore Barangaroo at leisure. Not only were we curious, but with lots of friends and family from overseas and interstate coming to visit us in Sydney this year, we wanted to find out if we should put Barangaroo on our ‘must see’ list. The short answer is yes. 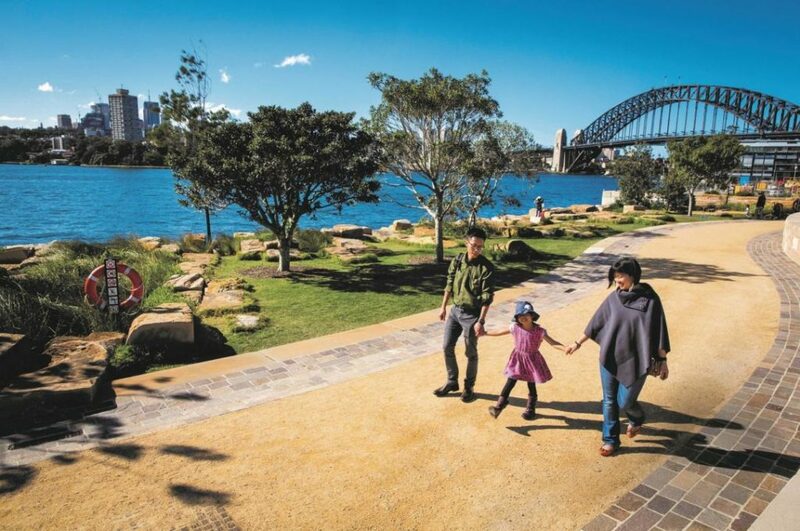 Families will find dozens of accommodation options within easy reach of Barangaroo. 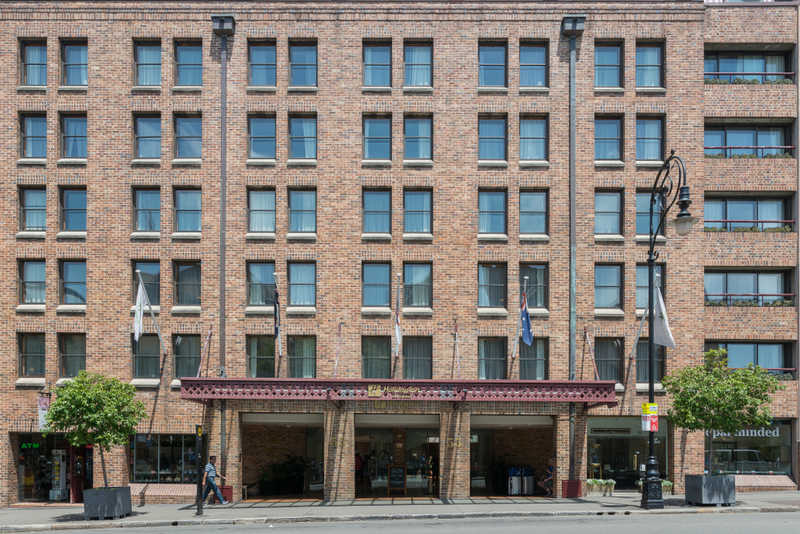 Our top picks for families are the Holiday Inn Old Sydney and the Sydney Harbour YHA. Both have pools and a relaxed family-friendly environment. We stayed at the Holiday Inn and loved the location, comfort of the rooms and friendly staff. If you prefer to self-cater, the Rendezvous Hotel Sydney, in The Rocks has one-bedroom apartments with kitchenettes and bathrooms with both a bath and shower. Sadly, there’s no pool. Hotel Palisade, at the intersection of The Rocks and Barangaroo Reserve, has trendy boutique accommodation. We loved the rooftop bar. The rooms have harbour views and the service is impeccable. But if you’re looking for either a pool or space for the kids to run around, this hotel isn’t for you. With an inquisitive 10-year-old in tow, we loved our one-hour tour of Barangaroo Reserve. The free tours run daily from Monday to Saturday at 10.30am (book via Eventbrite) and are led by one of the Aboriginal Visitor Services Guides. As we walked through the gardens our guide helped us engage all our senses. We learnt all about the history of Sydney Harbour and the importance of the land to Australia’s indigenous heritage. We especially enjoyed learning to weave some of the leaves and getting to feel what it’s like to have ochre painted on your skin. At the southern end of Barangaroo, among the bustling retail precinct, you’ll l find cutting-edge fashion and lifestyle stores including The Standard Store and The Waiting Room, as well as a boutique David Jones concept store. If you love chocolate, make sure to stop at Oh! Boo Chocolates. They create incredible hand-painted chocolates and you can join a chocolate tasting. The hot chocolate was a hit with the littlies, and the adults were surprised by the variety of pralines made with Australian native ingredients. If you have kids at primary school-aged kids or younger, you want to consider switching some of the boutique shopping for more younger child-friendly activities at the adjacent Cockle Bay precinct, a five-minute walk along the harbour foreshore from Barangaroo South. Cockle Bay is home to Sea Life Sydney Aquarium, Wild Life Sydney and Madame Tussauds – all of which are great wet-weather activities. Or keep walking another five-minutes to Darling Quarter where you’ll find the large playground with water feature and flying fox, an open-air art gallery, free ping-pong tables and the Monkey Baa kids theatre. Families looking for more teen-friendly shopping options, the major shopping areas of the Sydney CBD such as Pitt St Mall, Sydney Central Westfield and the Queen Victoria Building are all within a 10-minute walk from Barangaroo South. 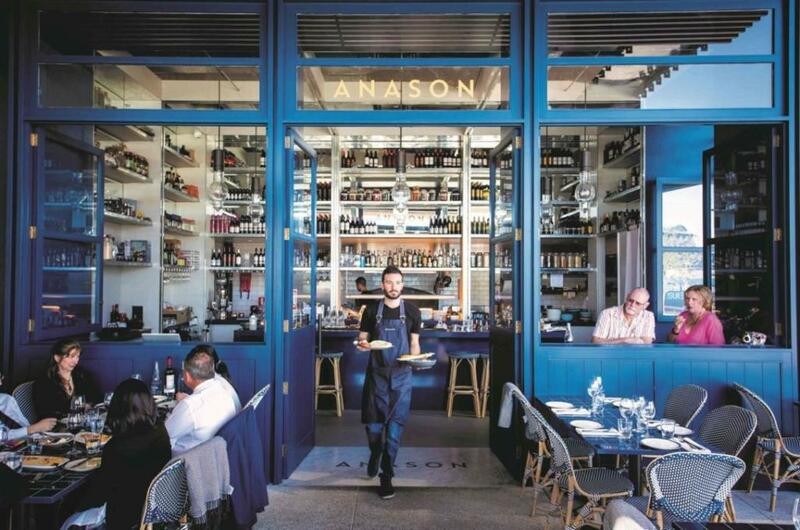 You’re spoilt for choice with places to eat at Barangaroo. For a quick bite, try The Canteen, which has freshly made sandwiches, sushi, burgers or fish and chips. If you’re in Barangaroo in the morning, grab coffee at Devon Café Barangaroo. Devon is a chic and modern inner-city café serving great coffee and juice to accompany a creative breakfast menu – the Dr Seuss is an especially fun and delicious take on green eggs and ham. They do dine-in or takeaway for breakfast and lunch. We had lunch at Ume Burger where they have four Japanese-inspired burgers on offer along with a selection of sides (including our favourite, Japanese Fried Chicken) and Hokkaido soft-serve ice cream. For the less adventurous try the classic hamburger or cheeseburger. For a more exotic taste, try the fish katsu burger or the vegetarian kakiage burger. Barangaroo Sydney is a great spot to picnic. Grab everything you need from Bel & Brio, a fresh food providore, selling gourmet produce, and ready-to-go meals for breakfast, lunch and dinner. For dinner, we loved love.fish. 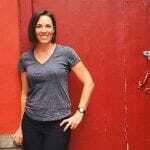 Their philosophy is to serve sustainable, local seafood that doesn’t cost the earth, and they nail it. The menu is simple yet delicious. Our go-to choice is the barramundi (which luckily is available all year round) and the lightly battered flathead fillets are a favourite with the kids. Barangaroo has some of the best (and cheapest) tickets to watch Sydney’s NYE fireworks. Families needing assistance to do the free guided tour of the Reserve can book to do the tour with a buggy. If you’re departing Sydney on a cruise, why not spend a morning in the gardens at Barangaroo before boarding the ship? Additional free programs run at Barangaroo Reserve during school holidays. Check the Barangaroo website for details of what’s on when. There is still a lot of development going on in some parts of Barangaroo (the precinct isn’t expected to be fully complete until 2024), so for kids who love trucks, cranes, boats and generally watching big machines do their thing, the Reserve is a great place to observe large-scale construction in progress. Vivid Sydney: What’s new in 2019?